For nearly a century and a half, artists have traveled from around the world to capture the atmospheric beauty of Monterey’s landscapes. This presentation of works in our collection celebrates the surrounding landscapes of Monterey and their rich histories. The variety of scenery from the rolling hills to rugged shores inspired artists to capture our region’s rich topography visually. 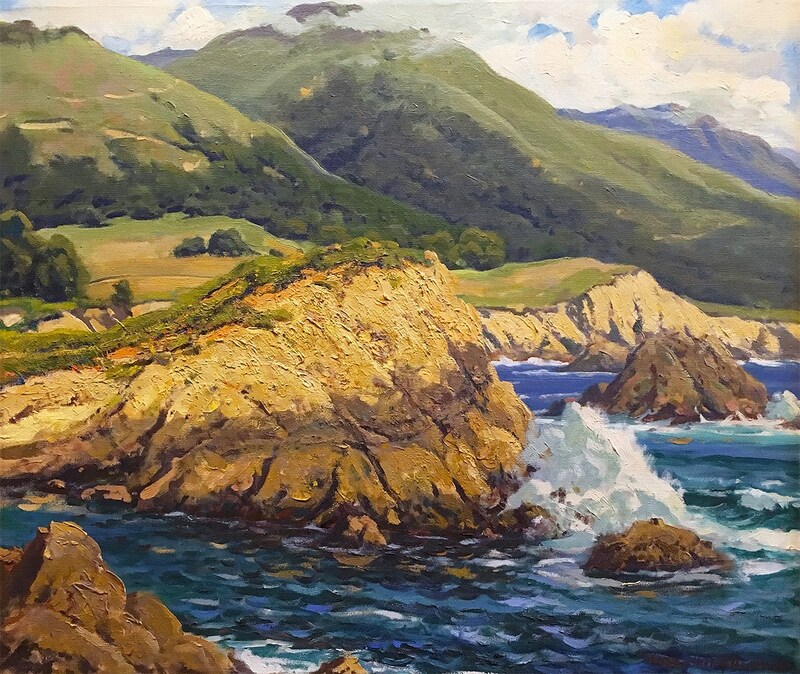 From historic Monterey adobes, ranches in Carmel Valley, stunning coastlines and majestic hills bridging Salinas and the Monterey Peninsula, each work captures a moment in time within that landscape. While the area has modernized, the natural beauty of these many locations remains unchanged today. This installation complements a virtual gallery that offers interactive experiences, created by artist and CSUMB Professor Enid Baxter Ryce and website designer Jenny Conte, supported by a generous grant from The James Irvine Foundation. The web-based, interactive gallery connects works in the Museum with the locations throughout Monterey County. Professor Ryce has created a map painting featuring the special “Monterey Places” within the exhibition and those labels are marked with a red location pin. These artworks can be accessed on the virtual gallery where you can explore and engage with these paintings, learn more about the specific location, local histories, and the artists who created them.